If you've been check out my wedding week posts, you probably noticed a common theme in a lot of our wedding decor- a custom monogram. I designed a custom monogram with our names in it and used it throughout the ceremony and reception to make the decor of both parts of the day feel cohesive and personal. Here's a close look at our monogram. I designed it to incorporate our names, wedding date, and red and silver wedding colors. Before our marriage ceremony began, we played a slideshow of childhood photos and photos from we were dating. 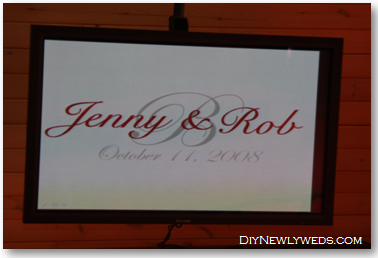 Once the slideshow was over, the screen displayed our monogram. At the church, the monogram was also featured on our wedding programs. Yep, you guessed it, I designed the programs too. My DIY wedding and monogram obsession continued when I hand painted the monogram onto our aisle runner. The custom aisle runner was one of my favorite parts of the church decor. My DIY antics also continued at the reception venue, where the monogram was featured on our menus. 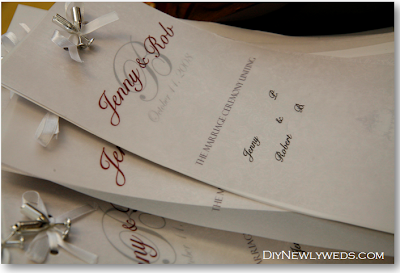 As you can probably guess, I created the menus myself also and made them to match our ceremony programs. What can I say, I love DIY projects and my wedding was no exception! Did you use a monogram for your wedding? What DIY projects did you do? I hope you've enjoyed the recent wedding week posts. Next, week we'll be back to our regularly scheduled programming! Ran across your blog when I was doing a search for table linens (?!) and just wanted to pop in and say how absolutely impressed I am with your creativity! I'm bookmarking your site, because I am sure there are still great ideas to come. And, of course, congratulations to you and your groom!